Ever find yourself dreaming of a tropical getaway? I do all the time! Now imagine taking it a step further and getting there on a luxury semi-private plane. Do I have your attention yet? It isn’t so much a dream as you might think. 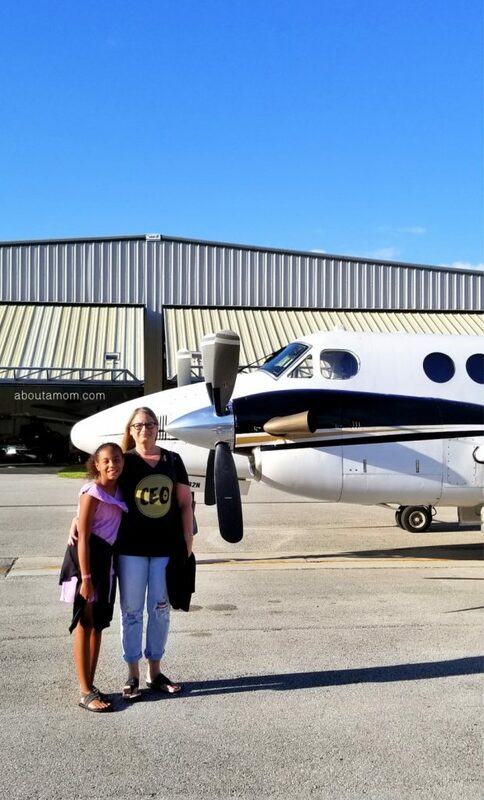 Air Unlimited will take your family, even the family dog, to and from the Bahamas from Sandford International Airport in Central Florida, and it is a lot more affordable than you would expect. Air Unlimited recently treated my daughter and I to a sunset flight, along the Florida coastline. We flew on the lovely 9-seater “King Air” which is part of Air Unlimited’s luxury fleet of semi-private planes and jets. 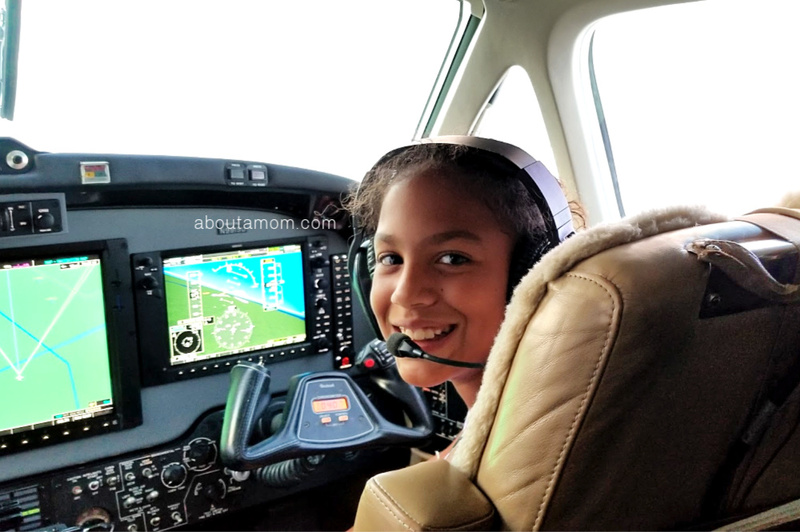 My 10-year old got to be one of the first to participate in the Air Unlimited Junior Pilot Program. She even got to sit in the cockpit for take-off and part of our flight. What an awesome experience that was for her! I could so get used to this way of travel. 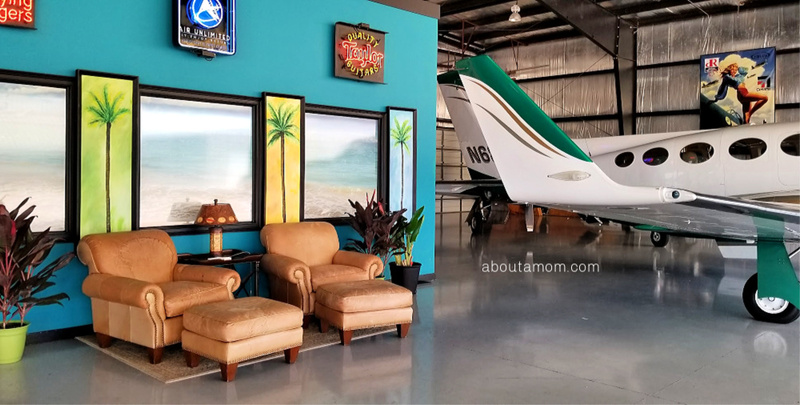 While Orlando is known for having one of the busiest airports in the U.S., Air Unlimited is a local gem offering quick reservations, free valet parking, fast check-in, no long lines, private waiting areas and free baggage up to 40-pounds. In flight, each of the nine seats feature window-views and plenty of leg room. These stand-out features are making family travel more convenient and hassle-free than ever before – all at an affordable price. 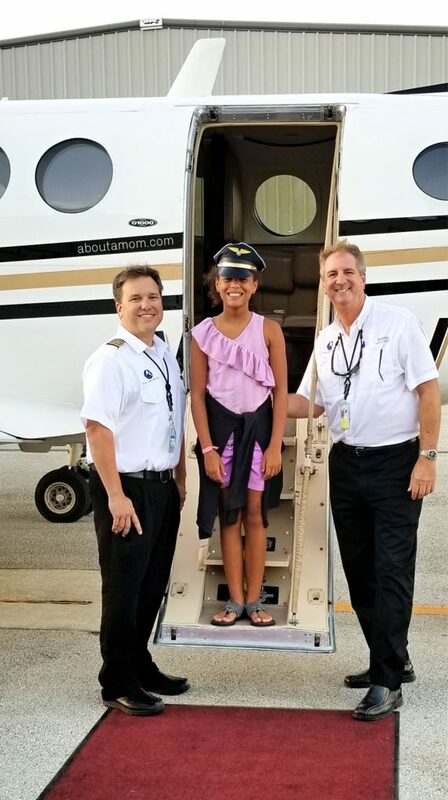 Air Unlimited has a commuter status, flies seven days a week, and offers four daily flights to Marsh Harbour and Treasure Cay in the Bahamas from Sanford, Florida. They also offer charter service for those who want to book a flight to other destinations. But no worries, you don’t have to book the entire plane. Simply go online and book by the seat as many seats as you need, and you will fly with anyone else who booked seats for that same flight. 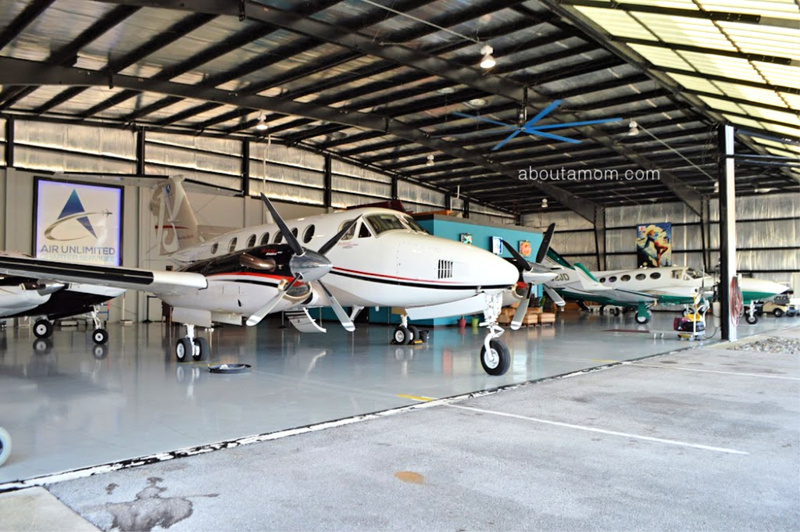 From the welcoming smiles that greeted us upon our arrival, to the beautiful offices and hangar space I knew right away that Air Unlimited offers something extra special to its customers. Have I mentioned that there are NO parking fees, checked bag fees, TSA checkpoints or long lines? This is alone is such a luxury! Not only is the parking free, but you park right in front of the Air Unlimited offices. From your car you are ready to board in a matter of minutes. The process is so easy, comfortable and stress-free. I mentioned earlier that we flew on “King Air” which is a 9-passenger plane and part of the Air Unlimited luxury fleet. I’ve flown first class a few times on traditional commercial airlines, and have to say that this was considerably more comfortable. There is really no comparison. The luxurious plane interior was decked out with nine reclining and spacious seats, situated in a family-friendly, intimate environment. There is plenty of space for you and your family to move around. No leg cramps happening there. Air Unlimited offers a unique travel services that makes traveling with kids and pets a breeze. Air Unlimited also offers a new way to entertain and inspire your kids during flight, making it a more positive experience for the entire family. 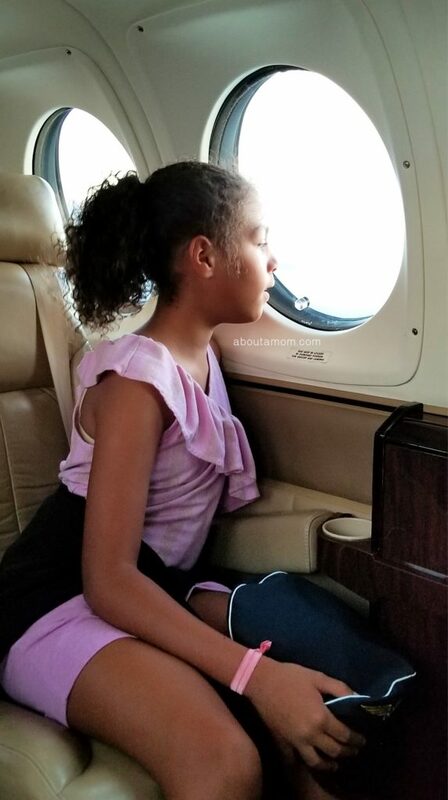 The airline offers a Junior Pilot Program, where registered kids fly in the cockpit with the pilot, experience spectacular views from the front of the plane and learn about the wonders of air travel. Participants receive a certificate, photos, a souvenir, and their very own pilot wings. This was such an amazing experience for my little girl and unlike any other children’s flying program I have heard of. T’s talking about wanting to get her pilots license after this experience. I love how it has opened her eyes to new possibilities. If you’re looking to make a stress-free tropical getaway at a surprisingly affordable price, I encourage you to check into a luxury flight with Air Unlimited out of Sanford to the Bahamas. This looks like a super fun time! Thanks for sharing! What a really fun experience. My grandsons would enjoy this. Never heard of this company before. But this looks like a nice thing for teenagers. How fun! That would be the way to travel. I would love to do this!